Mood board: Now that everyone in menswear is returning to the fluidity that Giorgio Armani first championed in the 1980s, it was the perfect moment for the designer to mine his own original mood board from that era. 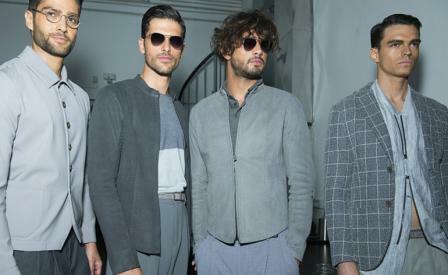 Unearthing Armani classics, but giving them just the right tweak made this a great show for Milan's champion of menswear. Best in show: The core of Armani's refreshed new look was loosened tailored pants, paired with a fitted upper half that was either a knit or traditional woven jacket, in chic shades of puddy, steel and greige. Finishing touches: Suits and sandals is the name of the season's fashion game and Armani did this beautifully with classical t-strap woven shoes paired with his pleat-front pants in olive or grape. Also noteworthy: a fat wheeled Emporio Armani bicycle that one model steered down the runway just in case Armani's new Motorino with Vespa is out of commission.